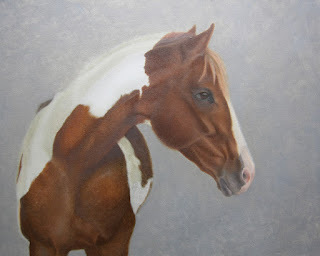 This is a painting of a sweet horse named Jellybean that I have been working on. It is still very rough and have only done one pass on the body and a second pass on the head, so a long way to go yet! I love the markings on this horse and plan to do a few more paintings and sketches of her as she is just so unique. The first layer of the background has also been applied in a neutral mid-gray value and the next layer of the background will be painted in color so that I further refine the color of her hair. If you are interested in painting in oil with me, I have a class starting this Monday at the Port Moody Arts Centre, from 12:30-2:30pm and there are still a few spots left. Please visit http://register.asapconnected.com/ClassDetail.aspx?pk=436228 to register online or call 604-931-2008.